I made major design changes to the Simplicity pattern 2617 pictured here. In order to make this purse and follow the steps below you will need to buy the pattern as three of the pieces are used in my directions. Watch for JoAnn’s newspaper coupons and get the pattern at a discount or download the JoAnn’s app to get coupons on your smart phone. I chose Silver and black, fake suede and snakeskin leather fabric and brought it together with chunky faux metal chain and lots of silver thread topstitching. 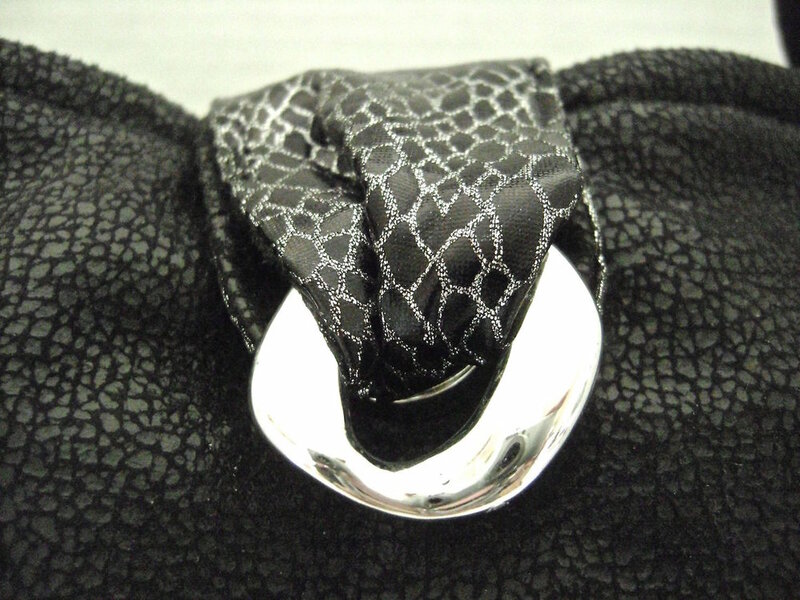 The snakeskin look fabric is used to face the top of the bag so you get a peek of it inside. The purse offers major functionality with seven pockets; four open and three zippered. Although most of the bag is soft, I built in simple structure at the bottom which keeps it from collapsing or falling over. Like a well behaved puppy, it sits and stays and looks great in the process! step 1 - Trace the Simplicity pattern lining piece for bag “A”. Cut it out and use it as a guide to create new pattern pieces that will form the shell for my bag. step 2 -Using the "A" tissue paper, trace the bottom portion of the pattern on a new piece of tissue. Draw a line across it 5” from the bottom. This will be your pattern for the purse front pockets "B". step 3 - On another tissue paper, trace the shape of the "A" pattern piece and draw vertical lines to create three sections. The center section should measure 5” across at the top and 8.5” across at the bottom. Create the new “C” pattern pieces by adding seam allowances on the new vertical lines. Cut tissue on the lines to create two "C" pieces leaving only the "A" center section. step 4 - Cut the remaining center of the "A" piece tissue from step 3, in half horizontally. These two tissue pieces now become “D” (top) and “E”(bottom). Trace them onto another tissue paper, and add seam allowances on the center horizontal and vertical cut lines for the two new tissue pieces. step 5 - Create a facing for the top of the bag by tracing the top of the Simplicity “A” pattern piece and drawing a horizontal line 3” down from the top. All your necessary pattern pieces are not finished. Piece “A” - cut one black, two fleece, two interfacing, and two lining. Piece “B” - cut one black, one snakeskin, and interfacing for each. The snakeskin piece should be 6” deep instead of 5”. Piece “C” - cut two black, and two interfacing. Piece “D” - cut one black, one lining (optional), and one interfacing. Piece “E” - cut one black, two lining, and one interfacing. Cut one of the lining pieces 1.5” longer than the other. Piece “F” - cut two snakeskin and two interfacings. Extend them 1.75” beyond the left and right edges. Zipper covers - 2” X 1.5” - two black, two interfacing. Purse snap flap - 10” X 2.75” - one snakeskin and one interfacing. Shoulder Strap - 16.5 X 4.25 - one black, one interfacing. Loops - 7” X 2.5” - two black, two snakeskin, and interfacing for each. Strap end covers - 3.5” X 2.5” - two black and two interfacing. #5 Side And Bottom - one black, one lining, one fleece, one interfacing, all cut on the fold. step 9 - Iron interfacing onto all pattern pieces. To create the purse front pocket, match the tops of the pocket pieces and stitch with right sides together. Reinforce the seam with stay tape as you sew. With wrong sides together, pin the bottom edges which will create the snakeskin trim on the top pocket edge. step 10 - Use a feather stitch (found on most zigzag machines) and silver metallic thread to top stitch across the pocket edge. step 11 - Baste the pocket to the purse front. Double stitch vertically from the pocket top to bottom in the center of the purse. Divide the spaces to the left and right equally and double stitch again, resulting in four individual pockets. step 12 - Fold the zipper cover pieces in half so they measure 1” x 1.5”. Pin one at each end of the zipper. step 13 - Center the zipper right side down at the top edge of the right side of “E” fabric. step 14 - Place the “E” lining (pink) right side down with top edges aligned. Stitch across, catching the zipper ends. Sew as close to the zipper teeth as possible. step 15 - Turn the lining so the wrong side is facing the wrong side of the fabric. step 16 - Optional - Baste the "D" lining to the "D" fabric. Baste the wrong side of “D” fabric to the right side of the longer “E” lining. With the right side of fabric to right side of zipper, sew “D” fabric and lining to the top half of the zipper. Layers have been shifted in the image to allow you to identify them more clearly. Bring the longer “E ” lining down over the zipper and match both “E” lining bottoms and sides. Stitch across the top of the zipper through the lining and zipper edge. Pin the sides and bottom of the two “E” linings to the “E” fabric. step 18 - Sew the “C” pieces to the center back purse. step 19 - Trim and turn the seams to the center. Topstitch with silver thread using the feather stitch. step 20 - Sew the #5 side and bottom piece to the purse front and purse back as per the Simplicity pattern instructions. Topstitch the two seams with the feather stitch. step 21 - Assemble the fleece padding by sewing the front and back to the side and bottom piece. Match the center of the mesh piece to the center bottom of the fleece’s wrong side. Stitch the mesh to the fleece. This can be carefully done on the machine with a stitch length to match the mesh or by hand. step 22 - Attach the zippered pockets on the front and back lining following the Simplicity pattern instructions. Sew together the front, back, side and bottom pieces leaving an opening in the bottom of one of the lining seams. Sew the two “F” piece seams together. With the wrong side of the facing to the right side of the lining, baste the strip to the lining. step 23 - Turn the bottom of the facing under .50” and topstitch in place. step 24 - Fold the purse snap flap in half with right sides together. Trim seam and turn right side out. Pass one end through one chain link and pin the raw ends together. Attach a magnetic snap to one flap layer. Stitch the layers together close to the edges and to within 1.5” of the link. step 25 - Create the two loops by sewing the snakeskin fabric to the black fabric with right sides together. Leave one end open. Shape the other end into a curve. Trim and turn right side out. Step 26 - Pin the fleece padding into the outer purse shell. When it’s in place, you should see the plastic mesh and fleece seams when you look into the bag. step 27 - Pin the loops to the sides of the purse with the black side up. Pin the purse snap flap at the top center back. step 28 - Slip the lining over the purse with right sides together. Stitch around the top sewing the lining, fleece and outer purse shell together. Trim seam. Stitch over the flaps again for reinforcement. Pull the purse out of the lining opening. Top stitch the seam to the lining. Center half of the magnetic snap to the front of the purse. Push the prongs through the outer purse and fleece layers. Attach the back of the snap between the fleece and lining. step 29 - Complete the loops by slipping the curved end through the last link in a four link chain. With black thread, sew the curved end to the center side of the purse 1.75” below the purse top edge. step 30 - Attach a decorative silver stud to the center of the loop. Push the stud through the purse shell and fleece. Attach the back side of the stud between the fleece and the lining. step 31 - Sew the open bottom lining closed and stuff the lining into the purse. Topstitch the entire top edge of the purse with black thread. step 32 - Fold the shoulder strap in half with right sides together. Pin the fleece over it and sew down the long edge. Trim the seam and turn the strap right side out. Use silver thread to topstitch along the center and close to both edges of the entire strap. step 33 - Fold the strap end covers in half and sew the edges together. The finished piece should be 2.5” long. Slip both covers over the strap and move them to the center. step 34 - Slip the strap ends through the last chain link attached to the loops. Fold the raw edge up and pin it to the strap. step 35 - Interface a piece of the black fabric measuring 3” X 10”. Fold the fabric in half with the right sides together. Sew along the length 1/4” from the raw edges. Turn right side out. Cut the piece in half to measure 5”. step 36 - Slip one end of the fabric piece between the purse loop and the first link. Slip the other end through the second link. step 37 - Slip both ends through the third link. step 38 - Slip both ends through the top link and pin them behind the strap. step 39 - Sew the fabric to the strap through all thicknesses. Trim excess. Slide the strap cover over the stitching and turn under the raw edges. step 40 - Attach a special silver leaf charm to the zipper pull. My total strap length from the top edges of the purse measure 22.5”. When cutting your strap, determine if you would like a longer strap by adding more fabric or more chain links. The chunky silver plastic chain is sold by the yard in the trim section of JoAnns. The links have a slight split on one side. To separate the links from each other, line up two splits and twist. The links will come apart easily. Unfortunately, after wearing my purse I discovered that the chain links occasionally come apart with movement. Not good! I needed to make a change to the original bag but I really liked the chain and didn’t want to replace it with something else. I finally came up with an easy solution - run a strap through the links. See step 36 - 39.